Make The Founders’ Second Amendment #1 on the New York Times bestseller list. Make The Founders’ Second Amendment a #1 bestseller on Amazon.com. 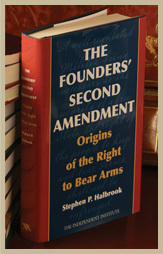 Make The Founders’ Second Amendment a #1 bestseller on BarnesandNoble.com. Make The Founders’ Second Amendment a #1 bestseller on BooksAMillion.com. Please pledge now using the email form on the right-hand side of the screen. When you pledge, you will be supplied a link where you can buy the book at online booksellers for maximum effectiveness and ensure that The Founders’ Second Amendment will become a #1 bestseller. Then, please spread the word to others!